OMAHA, Neb. -- Following a series of personnel lapses in the Air Force nuclear missile-launch officer corps over the past 15 months, some defense insiders are growing impatient for Defense Secretary Chuck Hagel to announce publicly the major steps he plans to take to address the matter. The Defense Department "is just not coming forward to make the improvements and the changes that are required to get the nuclear business back where we want to see it," says Bob Butterworth, an independent consultant on nuclear issues who in March offered his own recommendations for strengthening the Pentagon commitment to the mission. "The silence is deafening. It seems he is not anxious to do it." Following Hagel's visit to a Wyoming Minuteman 3 intercontinental ballistic missile facility in January, his spokesman said he was "deeply troubled" to learn of test-cheating by missile-launch control officers at a similar base in Montana. The spokesman, Navy Rear Adm. John Kirby, the following month said Hagel had directed two separate inquires -- one internal and another external -- to advise how best to address the string of embarrassing incidents. Those also have included a probe into drug possession by Air Force Global Strike Command officers and the dismissal of a general officer in charge of ground-based nuclear missile operations said to have become inebriated and acted inappropriately during an official visit to Russia. 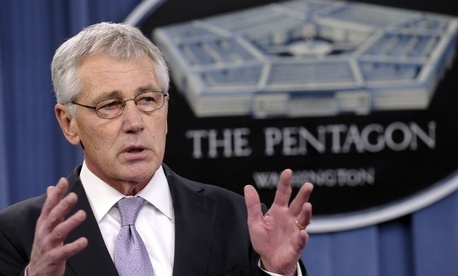 Hagel's 60-day internal review was completed this spring and the independent assessment also has since concluded, according to Pentagon sources. But the defense secretary has remained relatively quiet on the matter. Speaking to reporters here at a two-day conference on deterring global military threats, U.S Strategic Command chief Adm. Cecil Haney would not say when a formal announcement to lay out the entire get-well plan for the nuclear sector is anticipated. He did note, though, that "integrity lapses" occurred only among "a very small population" and that "the majority" of launch-control service personnel "woke up every day to do the business right." More than 90 officers initially were pulled off the job under suspicion of test-cheating or facilitating it, but about two-thirds of them have since returned to duty. Haney also said changes were being introduced as they become ready and are "not a stagnant thing." As one example, Global Strike Command early last month announced the creation of new mid-level positions aimed at bridging gaps between young operators and their commanders. "The people that are working on [nuclear operations] are extraordinary," said Haney, whose headquarters is based at Offutt Air Force Base near Omaha. "This was an unfortunate event, but I think we have moved and will continue to move forward in improving things across this capability, to ensure we have it for the future." Some defense officials say a number of new changes will be implemented beginning Oct. 1. The Associated Press in June reported that the Air Force was getting set to launch major reforms, to include bonus pay for officers pulling alert duty in underground command centers. Military personnel operating the other two "legs" of the nuclear triad -- bomber aircraft and submarines -- have received such extra pay for years. The initiative would also include funds to improve aging infrastructure and other morale-boosters for serving in the Minuteman 3 launch sector, according to the wire service. Air Force Secretary Deborah Lee James has strongly advocated bolstering her service's nuclear enterprise, to include recommending to Hagel that the United States increase the rank of the Global Strike Command chief -- who oversees nuclear-armed bombers and missiles -- from three to four stars. "I think James' intentions are good, but it's things I don't think the [senior] military Air Force is interested in doing . . . [Their] top priorities are a new bomber, a new fighter, a new tanker, and a new cruise missile," said one former Minuteman 3 missile squadron commander, who requested anonymity to speak candidly. The Air Force did not respond to questions about the matter. As the service prepares its fiscal 2016 budget request this summer for Hagel's approval and ultimately submission to Congress early next year, there is some debate among its military leaders over how much bonus pay to award missile-control officers and when to begin the initiative, this defense source and others said. The bonus pay -- and possibly also reinstatement of an earlier program that allowed missileers to earn free master's degrees as they sat on alert in underground control centers -- could constitute a shot in the arm to a mission specialty that has been humiliated by the repeated lapses, experts say. A renewed master's degree incentive program is "something they could implement in a matter of weeks," if desired, the former squadron commander said. The service could team with universities located near each of the nation's three Minuteman 3 bases for its 450 ground-based strategic missiles in Montana, North Dakota and Wyoming. "If they are serious they will implement some of these items, such as the bonus pay and education program and quality-of-life [initiatives] with a greater sense of urgency," this source said. "If they don't, it will make the situation worse than if they had not done anything at all." Some experts also have proposed consolidating Pentagon oversight of the nuclear mission into a single hierarchy, though that idea appears to be spawning turf battles among different offices that today share parts of the nuclear portfolio. Butterworth said if Hagel wants to underscore the value of the nuclear-armed missile mission, changes must come where junior and mid-level crews can see them. He and others noted news reports about broken blast doors and leaking sewage making long shifts in the control centers almost unbearable. "If basic repairs aren't made, you get smart after a while" about where senior-leader priorities lie, he said.